Populations of anadromous salmonids (Oncorhynchus spp.) in the Columbia River basin are currently the subjects of intense conservation activity following decades of decline. In recent years, avian predation across the basin has been considered a factor limiting recovery of these imperiled fish populations. Caspian terns (Hydroprogne caspia), double-crested cormorants (Phalacrocorax auritus), American white pelicans (Pelecanus erythrorhynchos), California gulls (Larus californicus), and ring-billed gulls (L. delawarensis) are native piscivorous colonial waterbirds with a history of nesting in the Columbia Plateau region. We investigated the impact on survival of juvenile salmonids from predation by piscivorous colonial waterbirds nesting in the Columbia Plateau region during 2004-2009. Within the Columbia Plateau region, overall numbers of breeding Caspian terns remained relatively stable during the study period at between 800 and 1,000 breeding pairs at five colonies; the two largest breeding colonies were on Crescent Island in the mid-Columbia River and on Goose Island in Potholes Reservoir. Overall numbers of breeding double-crested cormorants in the Columbia Plateau region decreased during the study period, from about 1,500 breeding pairs to about 1,200 breeding pairs at four separate colonies; the largest breeding colony by far was at the north end of Potholes Reservoir. Numbers of breeding American white pelicans increased at the Badger Island colony on the mid-Columbia River, the sole breeding colony for the species in the State of Washington. Overall numbers of breeding gulls, the most numerous piscivorous colonial waterbirds in the region, declined during the study period. Potential limiting factors for piscivorous colonial waterbirds nesting in the Columbia Plateau region include human disturbance, mammalian predation, availability of suitable nesting habitat, inter-specific competition for limited nesting habitat, and food availability. Overall breeding numbers of Caspian terns and double-crested cormorants in the Columbia Plateau region are an order of magnitude less than the numbers of these two species nesting in the Columbia River estuary, whereas California gulls, ring-billed gulls, and American white pelicans are far more numerous in the Columbia Plateau region than in the estuary. 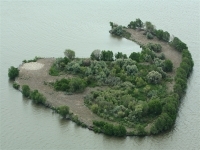 We used bioenergetics methods to estimate prey consumption by Caspian terns nesting at Crescent Island and double-crested cormorants nesting at Foundation Island, both located in the mid-Columbia River just below the confluence with the Snake River. Taken together, the Crescent Island tern colony and the Foundation Island cormorant colony consumed approximately one million juvenile salmonids annually during 2004 – 2009. Estimated annual consumption of smolts by Foundation Island cormorants ranged from 470,000 to 880,000, while that of Crescent Island terns ranged from 330,000 to 500,000. Consumption of salmon smolts by the Crescent Island tern colony declined during the study period, tracking a decline in colony size. Consumption of steelhead (O. mykiss) did not decline, however, perhaps reflecting greater steelhead availability in later years due to reduced transportation rates of Snake River steelhead. There was no apparent trend in smolt consumption by Foundation Island cormorants during the study period. Relative to salmonids, consumption of lamprey was minor, with fewer than 10,000 lamprey macropthalmia consumed per year by both colonies combined. We recovered passive integrated transponder (PIT) tags from salmonid smolts on nine different piscivorous waterbird colonies in the Columbia River basin to evaluate avian predation on juvenile salmonids during 2004-2009. These nine bird colonies had the highest numbers of smolt PIT tags of any in the Columbia Basin. Minimum estimates of predation rates based on PIT tag recoveries were used to determine which salmonid stocks were most affected by avian predation and which bird colonies had the greatest impact on smolt survival. This system-wide evaluation of avian predation indicated that Caspian terns and double-crested cormorants nesting on East Sand Island in the Columbia River estuary were consuming the highest proportions of available PIT-tagged smolts. However, Caspian terns and double-crested cormorants nesting at colonies in the Columbia Plateau region also had significant impacts on survival of specific salmonid stocks. Predation rates by Crescent Island terns on Snake River summer steelhead (7.7%) and by Goose Island terns on upper Columbia summer steelhead (10.0%) were substantial during the study period. Predation rates by Foundation Island cormorants on Snake River summer steelhead (2.0%) and Snake River sockeye (1.7%) were not as high, but notable. Predation rates by gulls and pelicans nesting in the Columbia Plateau region were minor (generally < 0.5% of available smolts) compared to smolt losses from inland tern and cormorant colonies. Hatchery smolts were often more susceptible to avian predation relative to their wild counterparts, although exceptions were numerous. Smolts out-migrating in June and July were often consumed at higher rates by birds than smolts of the same stock that out-migrated earlier (April or May). Predation rates on PIT-tagged smolts that were adjusted for colony size (i.e., smolt consumption per bird) were substantially higher for terns and cormorants nesting at colonies in the Columbia Plateau region compared to those nesting in the estuary. Thus, while inland colonies of terns and cormorants are much smaller than their counterparts in the estuary, inland colonies can be more reliant on salmonids as a food source. This greater reliance on salmonids, coupled with lower diversity of available salmonid stocks compared to the estuary, is responsible for the unexpectedly high impact of some inland tern and cormorant colonies on specific stocks of salmonids, particularly steelhead. Current management efforts to increase smolt survival through reductions in tern and cormorant predation in the estuary could result in some terns and cormorants from estuary colonies recruiting to inland colonies, potentially resulting in higher predation rates on certain ESA-listed salmonid stocks. Recruitment from estuary colonies may result in small, but significant increases in numbers of these two species nesting in the Columbia Plateau region. Nesting habitat and food supply appear to limit Caspian tern numbers on the Columbia Plateau and the demographic connectivity between the double-crested cormorant colony in the estuary and those on the Columbia Plateau appears limited. Although the number of Caspian terns that could relocate from estuary colonies to colonies on the Columbia Plateau is likely small relative to numbers nesting in the Columbia River estuary (< 1,000 adults), the impact on specific steelhead stocks could be substantial and warrants monitoring. We investigated factors that influence susceptibility of juvenile salmonids to avian predation using juvenile steelhead from the threatened Snake River stock. Steelhead smolts (n = 25,909) were captured, externally examined, marked with PIT tags, and released to continue out-migration during 2007-2009. Recoveries of steelhead PIT tags on the Crescent Island Caspian tern colony indicated that steelhead susceptibility to tern predation increased significantly with declining steelhead external condition, decreased water discharge, decreased water clarity, and increased steelhead length up to 202 mm (fork length), but decreased for larger steelhead. Recoveries of PIT tags on the Foundation Island double-crested cormorant colony indicated that steelhead susceptibility to cormorant predation increased significantly with declining steelhead external condition, plus steelhead of hatchery origin were more susceptible compared to their wild counterparts. These results indicate that steelhead susceptibility to avian predation is condition- and size-dependent and is influenced by both river conditions and rearing environment (hatchery vs. wild). These findings unequivocally demonstrate that at least a portion of the smolt mortality caused by avian predation in the mid-Columbia River is compensatory. We also assessed the abundance, distribution, and diet of double-crested cormorants over-wintering on the lower Snake River in eastern Washington to investigate the potential for significant impacts from cormorant predation on survival of ESA-listed fall Chinook salmon that over-winter in the lower Snake River. A monthly average of 256 cormorants was observed on this reach of the lower Snake River. Overall diet composition of cormorants was highly variable and changed as winter progressed. The most prevalent prey types were centrarchids (34.3% by mass), followed by shad (15.0%). Fall Chinook salmon comprised an average of 3.4% by mass of the cormorant diet. Biomass consumption of all salmonids by overwintering cormorants was estimated at 3,100 to 11,000 kg, or about one third of the estimated salmonid biomass consumption by cormorants nesting at Foundation Island. The bulk of the diet of over-wintering cormorants, however, consisted of non-native fishes that compete with or depredate juvenile salmonids. Based on the results of this study, the greatest potential for increasing survival of smolts from ESA-listed salmonid stocks by managing inland avian predators would be realized by focusing management efforts on Caspian terns nesting at colonies on Crescent Island, Goose Island, and the Blalock Islands. Reductions in the size of these tern colonies would enhance survival of upper Columbia River and Snake River steelhead stocks in particular. More limited enhancement of smolt survival for Snake River steelhead and Snake River sockeye could be achieved by managing the double-crested cormorant colony at Foundation Island. Management of other inland piscivorous waterbird colonies in the Columbia Plateau region would provide relatively small and perhaps undetectable increases in stock-specific smolt survival. Further work is necessary, however, to translate smolt consumption and predation rate estimates into assessments of the potential benefits for threatened and endangered salmonid populations of reducing avian predation in the Columbia Plateau region. The analysis of potential benefits from management of piscivorous waterbirds for restoring ESA-listed stocks of salmonids is key to informed decision-making, as resource managers consider management of specific waterbird colonies on the Columbia Plateau, and identifying management objectives.